My inkstand is made of a flat piece of Untersberg marble which is hollowed out to receive the glass inkpot; and the inkpot has a cover with a knob made of the same stone. Behind this inkstand there is a ring of bronze statuettes and small terra cotta figures. I sat down at the desk to write, and then moved the hand that was holding the pen-holder forward in a remarkably clumsy way, sweeping on to the floor the inkpot cover which was lying on the desk at the time. As one might imagine, Freud’s clumsiness was no accident. His sister had visited his office and mentioned her plan to replace the unfortunate inkstand with one that better matched the desk; his desire for her to return bearing this gift led him unconsciously to annihilate the inkstand cover while sparing the statuettes. The mishap is evidence, he argues, that seemingly accidental motions, rather than being simply spastic anomalies, are guided by a hidden intention. With this anecdote, Freud rewrote a nineteenth-century running narrative of shattered inkstands and spilled ink. Ink and its numerous accessories became the technology of mass communication in an era when tens of millions acquired literacy and began writing letters, household lists, diaries, and other ephemeral, non-literary forms. Yet ink, a messy, accident-prone technology, constantly betrayed its users’ intentions. “[W]hat a nuisance is ink! It is a barbarism altogether…. [W]here is the house in which there has never been any spilling of ink, in study, drawing-room, boudoir, or kitchen?” railed E.S. Dallas in 1862.1 The challenges of spilled, smudged, blotted, evaporated, thickened, moldy, crusty, dried, frozen, and faded ink can be inferred from the sheer number of new and improved inkstands advertised and reviewed throughout the century. In accident-free writing, ink disappeared into information and meaning. Conversely, whenever one saw ink, one glimpsed the chaos of raw natural material — pigment, gum, wasp eggs, carbon — that gave information and meaning their existences. As its mere, illegible self, pooled or blotted ink deconstructed the rational order of handwriting. Tracing this cultural logic, the following essay sutures a nineteenth-century epistemological shift about the nature of accidents to the material practices and domestic uses of ink. At the apex of this shift, Freudianism transformed accident into purpose, converting chance into unconscious intent, a new conceptual gesture exemplified by his broken inkstand cover. Though his anecdote features a luxury marble version, it enlists the everyday middle-class experience of spilling ink into his theory of the unconscious. When Freud and other thinkers, artists, and psychologists eliminated the ink accident, they also illustrated an essential paradox of ephemera, that it is never as incidental as it appears. As this collection of essays has been demonstrating, ephemera includes the trivial, disposable material of everyday life, such as bus tickets, bookmarks, television advertising, and short messages; I expand this field to include their constituent parts and materials like ink. Such things are “accidents” in the Aristotelian sense that they are incidental to the main event or purpose – the bus ride, the experience of reading, acts of production and consumption, and electronic conversations. For Aristotle, the accident is a non-essential quality, rather than the quiddity of a thing or the heart of a relation.2 Moreover, it is also a chance occurrence. Aristotle claims that the accidental cannot be theorized according to underlying laws; in a remarkably durable conceptual move, the ancient philosopher declares that accidents just happen.3 Ink, in its messiness, materialized this gesture. Ephemera itself partakes of this contingency and randomness: as with its material, ink, it calls attention to itself when it is out of place, no longer facilitating communication or motion, but enduring beyond its moment, rediscovered in a pocket or inbox. The Freudian turn redeveloped the Aristotelian order by making the incidental, the ephemeral, and the quotidian – such as the inkstand — central to acts of interpretation, and linking them to hidden psychological causes.4 It infused the accident with purpose, nullifying its essence. As Paul Fyfe writes of this turn in nineteenth-century epistemology, “The moment of accident… is the moment of interpretation…. Accident is the interpretive moment of chance.”5 The elimination of the accident furnishes the episteme within which ephemera is paradoxically invested with enough purpose or meaning to be preserved. Discourses and practices involving ink illustrate and embody this shift. 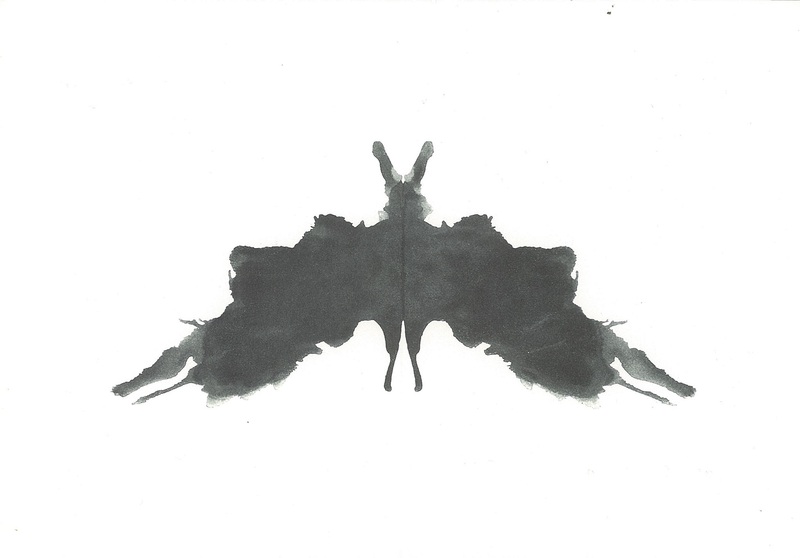 The inkblot as psychological test engineered the inwardness of deep subjectivity. It did so by extending the common nineteenth-century conflation of memory and the unconscious.7 As Thomas De Quincey put it, “there is no such thing as forgetting possible to the mind.”8 In the 1860s, Forbes Winslow elaborated the idea, extolling “the tonic, permanent, and indestructible character of the impressions made upon the cerebrum” from infancy through adulthood.9 Rather than theorizing a mental structure that purged disposable information and experience from the mind, nineteenth-century writers imagined its capacity to keep even the most trivial. A connection emerges here, between the ephemerality of experience and material ephemera. 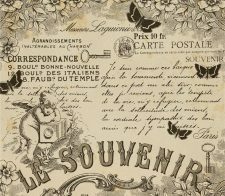 Like minor experiences, material ephemera is meant to be forgotten or discarded; yet it is often kept, whether stored in the mind, amassed in boxes, or curated in collections. As noted in the introduction, scholars such as Laurel Brake and James Mussell have each challenged the allegedly easy disposability of ephemera; Mussell describes its uncanniness, as a marker of things a culture intends, and fails, to forget.10 His observation connects our digital moment to the nineteenth century, when the question of what to keep, and what to throw away, first confronted mass media consumers on a daily basis. Within the ideology of projection, the mind’s ability to store every impression and experience furnished the individual’s “private world”; when the tester elicited apparently accidental but truly crucial memories, the subject conjured the vastness of this archive. As ink’s liquid darkness became the ground of projection, deep subjective formations surfaced into the light. Reconstructing the long, intertwined intellectual and material history of such projective tests from the social, cultural, visual, and literary history of handwriting, blotting, art, and game-playing illustrates how the accidental and the ephemeral restructured memory and the unconscious. Industrialization set the scene for the accident, and because handwriting skills were acquired in the shadow of print, an industrial process, a brief sketch of writing and printing ink is useful here. In Europe between 1800 and 1850, ink-making transformed from an artisanal to an industrial process; as both its production and consumption accelerated, accidents proliferated. In this period, steel pens manufactured in Birmingham supplanted goose quills. Previously, writers often had to pause to cut and mend the nibs of feather quills, but steel pens allowed writing to race along the page without interruption. Ink manufacturers changed their recipes, seeking ink that would flow freely through steel, emerging neatly onto cheaper, mass produced paper. As we have already seen, however, so smooth a process was hard to obtain. Distribution also changed. 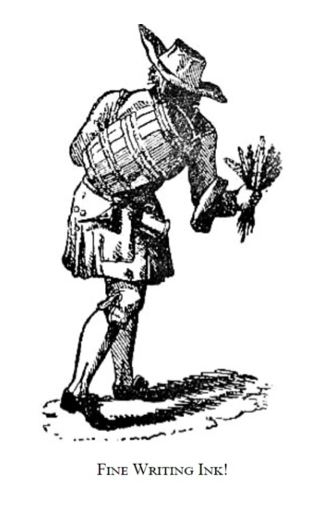 Traditionally, itinerants and apothecaries sold ink; the famous figure of the “Ink-Man” carried a barrel on his back, as well as pens, a pint measure, and a funnel. 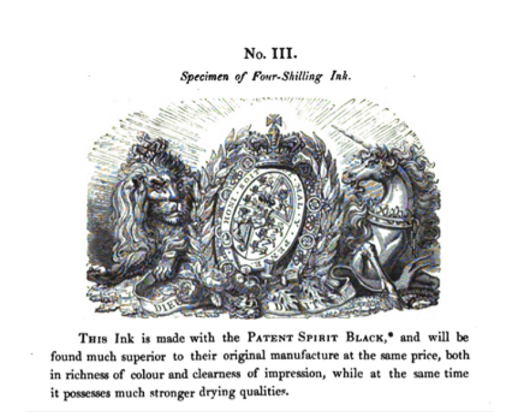 (Figure 1).11 At the turn of the nineteenth century, the explosion in printing expanded specialized ink makers such as Blackwell, and Thomas Martin; small-scale printers gradually stopped making their own ink. Fig. 1: The Ink Man. Fig. 2: Specimen of Martin’s Ink. Martin’s exquisite advertisements utilized precision printing to flaunt the properties of six-shilling writing ink, setting an elusive ideal for writers. (Figure 2). 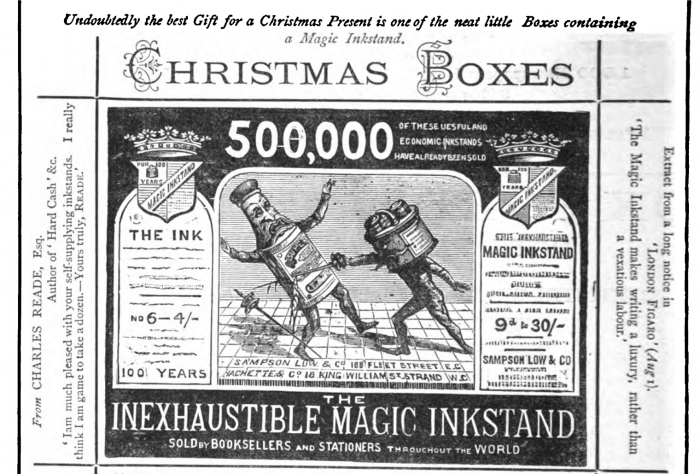 They also signaled the shift from the ink-man’s auditory, local advertising to a visual mass medium. But printing, like handwriting, was also prone to accidents. Many inks were made with wasp eggs known as galls; the tannic acids in them bit into the paper and occasionally tore it, causing “picks.”12 Uneven application of ink to rollers, as well as bad grinding or incorporation of pigment into the ink body, could cause dark spots on the paper, known as “monks,” or white spots on the text, known as “friars.” One over-confident writer predicted in 1814 that improvements in presses would soon eliminate “these ghostly personages.”13 Printers looking to reduce their costs might substitute cheaper linseed oil for nut oils, though linseed oil could turn yellow over time.14 Public demands for print made speed a new priority, so printers were often tempted to cut corners. Such mundane problems pale in comparison to the spectacular, catastrophic accidents of technologized postmodernity theorized by Paul Virilio, but his deconstructive gesture also applies to them. “The word ‘accident’ signifies what arises unexpectedly – in a device, or system or product…. As though this ‘temporary failure’ was not itself programmed, in a way, when the product was first put to use.”15 Ink’s new status as mass industrial technology, keyed to accelerating consumption, created accidents on domestic writing desks and in printing presses alike. The idealized swift current of writing ink recalls the absorptive psychological experience Mihaly Csikszentmihalyi has described as flow. This seemingly transcendent mode of presence comes from being in sync with capitalist experience. An “optimal experience,” flow is “a sense of exhilaration, a deep sense of enjoyment” that occurs “when a person’s body or mind is stretched to its limits in a voluntary effort to accomplish something difficult and worthwhile.”16 In moments of engaged creative production or athleticism, self-consciousness, distractions, and awareness of the passage of time all fade away, and one achieves something resembling presence. Samuel Taylor Coleridge’s theory of the imagination as the “inward eye” suggested a similar sublimely absorbed state of mind; to illustrate it, he imagined an ideal inkstand that would connect thinking to writing without distraction: “[T]he pen should be allowed, without requiring any effort or interruptive act of attention from the writer, to dip sufficiently low, and yet be prevented, without injuring its nib, from dipping too low, or taking up too much ink….”17 Perfectly calibrated pens and ink permit thoughts to flow from the mind onto the page. Yet modern ink both enabled and hampered unfolding thoughts. The appearance of new inkstand designs throughout the century suggest the quest for flow. “There are few articles upon which so much ingenuity has been employed as inkstands, but hitherto no person has succeeded in producing one wholly free from exception,” declared a reviewer of one with a rubber diaphragm.18 Others describe inkstands fitted with caoutchouc to prevent leaking; piston-operated inkstands that force ink to rise into the barrel; and similar “gravitating” inkstands that preserved ink from air and dust.19 Sampson and Low claimed that their “Magic Inexhaustible Inkstand” made writing “a luxury, rather than a vexatious labor” (Figure 3).20 Defeating an older model of ink bottle, their more technical apparatus promised a constant supply of ink, drawn as precisely as a rapier, and ever ready to materialize the writer’s thoughts on paper, the tidy grid of reason. Yet spills, leaks, and blots often marred such fantasies. Raging against ink and desperate for better technology, Dallas pleaded, “Can we not have… a kind of pencil which shall make black and indelible marks without being heavy, without needing cutting, and without using up too fast? Till some magical method is flashed upon the world, whereby ideas can be recorded as the sunlight records form and shadow, we must demand more convenient implements.”21 In Dallas’ imagination, ink would flow as apparently effortlessly as the new medium of photography harnessed the sun. Industrial demands for productivity, speed, and efficiency sparked the dream that the writer’s mind and hand could keep pace. This happy, generative state of flow reflected the individual writer’s absolute synchronicity with modernity. Fig. 3: “The Inexhaustible Magic Inkstand” from Publisher’s Circular, 1874. The exasperating reality of ink’s messiness and interruptions to thought found cultural expression in the common trope of inkstands accidentally overturned, or hurled in anger. Freud’s theories assign accidents to hidden drives and subconscious tendencies, but here we can also observe the political unconscious at work. Few other household items exceeded the spectacular mess of ink, or the painful injuries it and its containers inflict, especially in the hands of wrathful children. Flying ink and inkwells ruin the order of the schoolroom, where middle-class children, as new writers and readers, are meant to be learning their appropriate uses. When the schoolmaster Ichabod Crane is invited to a frolic at the van Tassel house in “The Legend of Sleepy Hollow” (1820), he hurries his pupils to finish their lessons, wreaking havoc: “Books were flung aside… inkstands were overturned, benches thrown down, and the whole school was turned loose an hour before the usual time, bursting forth like a legion of young imps….”22 In Charles Dickens’ Bleak House (1853), Esther Summerson finds the “jaded and unhealthy-looking” Caddy Jellyby with ink on her face, as she miserably attends to her mother’s pointless charitable correspondence regarding Boorioboola-Gha.23 In Alice’s Adventures in Wonderland (1865), Lewis Carroll, ever ready to mock educational order, has the Queen of Hearts lob an inkstand at Bill the Lizard, who pathetically commences writing on his slate with his finger, “using the ink, that was trickling down his face, as long as it lasted….”24 In these and similar narratives, ink and its accessories elicit and reflect a hotheaded physical expressivity that will not wait for writing. Ink sticks to fingers and faces instead of flowing from minds. Such representations register the uneven transition to literacy and increased writing activity of minor social actors: children, servants, women, soldiers, clerks, and others. The mayhem of thrown ink and inkwell narratives, as well as that of ink that overflows its confines, reflects the friction of their entry into a world of writing and print dominated by propertied men. Formerly incidental to the public sphere, new social actors forced it to reshape itself to include them as participants in its communicative networks. They represent the political unconscious of ink blots. Not all ink accidents were so spectacular, yet they substantively engaged wider formations of cultural identity and memory. One particular problem generated much discussion: fading. If ink spills represented matter out of place, then faded ink represented matter vacating its place.25 Carbon-based inks were susceptible to deterioration through abrasion as the gum wore off; but turn-of-the-century writers also observed with alarm that acidic inks, in spite of biting into paper surfaces, were also losing their color and rendering documents illegible. In 1817, the U.S. Secretary of State Richard Rush observed that “the hand of time” had already faded signatures from the Declaration of Independence.26 In 1803, Thomas Astle, the Keeper of the Records in the Tower of London, had written with urgency of the need for “Ink of such durable quality, as may best resist the destructive powers of time and the elements…” in order to preserve Parliamentary records, court decisions, and the records of property exchanges.27 The stakes were high enough for Britain to establish the Public Records Office to organize and preserve all such documents.28 The archive achieved form, but could still lose its content. The Royal Society, advertising in The Gentleman’s Magazine and several other publications, promised fifteen guineas to the discoverer of a method for making cheap, indelible black ink.29 Proposals appeared, incorporating lavender oil and copal, or bistre, made from charcoal or burnt wood.30 Fading represented an accident in the technological system of mass print and handwriting that undergirded government and commerce. In this context, the quest for an indelible ink points out the new need for ephemera to be archived. 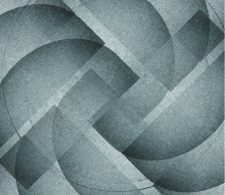 The burgeoning mass of paper contracts documenting property exchanges, trade, and local and national governance, created a challenge for information storage. The dream that it could all be saved and organized, and that the archive would resist disintegration, partook of the fantasy of an individual’s expansive, efficacious memory. A totalized archive might just resist ephemera’s fleeting quality; an organized one would be impervious to accidents. Both had to resist ink’s accidental fading and other failures. At the outset of this essay, I cited Paul Fyfe’s insight that “accident is the interpretive moment of chance.”31 Before moving into the ink blot aesthetics and games that gave rise to Rorschach’s test, I want to briefly and broadly sketch the nineteenth-century intellectual history that forged this relationship between chance and accident. Ian Hacking claims that “during the nineteenth century, it became possible to see that the world might be regular and yet not subject to universal laws of nature. A space was cleared for chance.”32 Chance displaced determinism, but it also inspired a vast, multifarious project in which scientific investigation, statistical thinking, and the concept of the norm overcame chance, converting its chaotic lawlessness into the general operational rules of the natural world. The shift can be seen in literary as well as scientific archives, which attempt to build meaning into chance through the discourse of the accident. Tracing the modern transformation of the accident through Austen, Wordsworth, Darwin, Eliot, and Freud, Ross Hamilton shows how it shaped selves into subjects. For example, Darwin’s theory of natural selection had furnished a comprehensive, secular interpretation of accident as formative of the natural world; artists such as Stephané Mallarmé privileged the accidental while denying it full meaning in their aesthetics; and Freud remade the accident into the symptom in his theory of repression. Indeed, a robust realist tradition from Charles Dickens to Thomas Hardy, which drew on urban sketch narratives, had struggled to invest chance with meaning. These and other writers grappled in their own ways with the demise of providence, resemblances, and other older forms of order and stability; the emergence of normativity and statistical thinking; and their effects on the self. Freud culminated this tradition with his theory of the psychic accident as the ironic sign of the unconscious: it was precisely those events that one attributed to chance, that required analytic investigation.33 Before twentieth-century writers began to concede the utter meaninglessness of chance, nineteenth-century writers confronted its possibility, and devised the accidental as a way around it. This very generalized context grounds our understanding of the specific material and aesthetic practice, arising at mid-century, of deliberately preserving accidentally spilled ink. Between efforts to remove accidental ink stains, and the quest for an indelible ink to preserve valuable documents, lay the purposeful making of ink blots, by artists and children.34 In doing so, they engaged the stubborn substance of ink anew. Blotted ink achieves the formal stability of an aesthetic object. Preserving the randomness, it documents the everyday mishap – and in its act of archiving, creates the possibility of recuperating meaning . 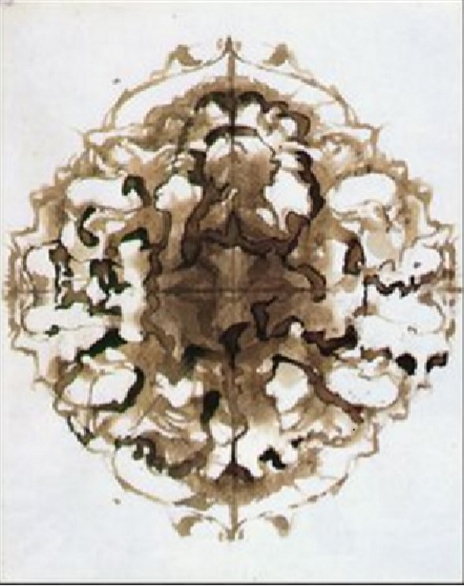 Victor Hugo and Justinus Kerner began making inkblot art because they imagined something evocative and valuable in random confluences. The converse of the Public Records Office’s battle against fading ink, their aesthetic also sought to preserve documents — but of the trivial, the random, and the ephemeral. A playful affect motivates their experiments, a revelry and pleasure in the accident rather than its immediate correction or rejection. The accident might have something to teach its observers, though they didn’t yet know what that lesson was. Preserving the ephemeral, Hugo and Kerner also enacted its modern paradox, of keeping what one is meant to discard. Their interest in the stochastic assists the cultural shift from imagination and aesthetic choice to otherworldly and unconscious behavior whose meanings are hidden from the self. Hugo’s engagement with his materials was vigorous, spontaneous, and full-bodied. As his grandson recalled, “He scattered the ink haphazardly, crushing the goose quill which grated and spattered trails of ink. Then he sort of kneaded the black blot which became a castle, a forest, a deep lake or a stormy sky; he delicately wet the barb of his pen with his lips and with it burst a cloud from which rain fell down onto the wet paper….”37 Hugo’s intensive physical engagement with his materials makes his blots into unique bodily and affective expressions. To give his compositions an air of informality, he used his own fingerprints, decades before Francis Galton proposed their systematic utility to police investigations.38 Hugo’s willingness to stain his fingers with ink inverts the traditional discourse in which rambunctious and maladroit children cover themselves and each other in ink. Whereas they reflected the messiness of an expanding world of communication, Hugo’s deliberate, expressive ink messes suggested the privilege of a world-famous writer to experiment in his own study. His taches and pliages circulated mainly among friends and family; they were not exhibited until the Galerie Georges Petit displayed them in 1888, three years after his death.39 Hugo’s vast archive makes inkblot art, long overlooked, central to the meaning of chance in the later nineteenth century. Hugo’s exploration of the material and temporal properties of ink engaged and shifted the sense of “flow” Coleridge anticipated in his ideal inkstand. Instead of leading to communicative clarity and efficiency, and valuable productivity, Hugo’s dalliances with ink’s liquidity generated random, obscure images of dubious worth. “Either he allowed the tache to expand by itself, modified only by the quantity of water, the quality of paper and the obstacles it encountered in the course of its haphazard journey, or he guided it deliberately, steering it along paths opened up by chance….”40 Hugo tilted the paper, marbled the ink by pressing two pieces of paper together, rubbed, dabbed, wiped, and smeared ink as his fancy took him. He let it stand, and pulled it away. The compositions reflect the desultoriness of the method: often without perspective, they can vault viewers headlong into a space, a time, an atmosphere. 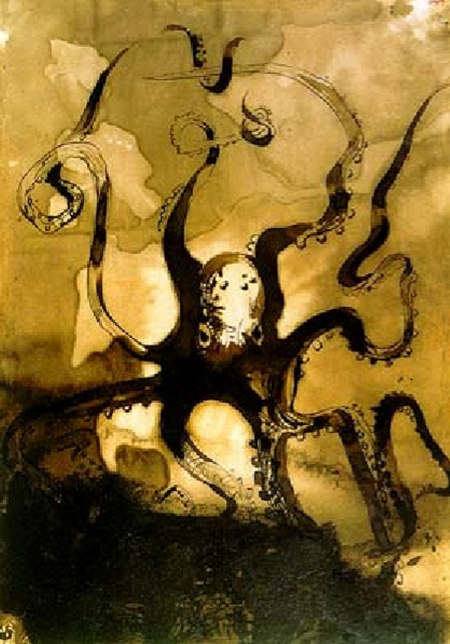 And yet, within these dimensions, meaning – even writing – returns: consider Octopus with the Initials VH (c. 1866; Figure 4): the cephalopod’s sinuous radiating tentacles suggest the random travels of ink across a page. And yet they curl into letters, transforming the accident into an aesthetic act by forming the artist’s signature. The squid itself produces ink, and Hugo even used it, as well as blackberry juice and caramelized onions, transforming nature into culture. Hugo’s ink play also engaged and confronted printing, especially in his pliages, made by folding paper over a blot to transfer it to the other side. This procedure, as well as his habit of pressing ink-soaked lace onto paper, were like handmade printings. Moreover, he made use of both sides of the paper, as print did. Visually, the symmetrical, repeating figures of the pliages recalled mass production, especially of wallpaper design or architectural ornament. (Figure 5 “Rosette” p. 65). The stochastic performances of Hugo’s ink parodied the substance’s role in the new age of print, accelerated communication, and intensified commodity culture. The nineteenth century’s other notable ink blot artist was, like Hugo, a late Romantic: the German poet, mystic, and physician Justinus Kerner, who wrote and drew Die Klecksographien (1857) a series of inkblots and accompanying poems. Like Hugo, Kerner purposively touched up his random blots; but he more systematically develops his klecksographien to represent the otherworldly, macabre creatures that formed the visual and folkloric vocabulary of German Romanticism. His eyesight failing in old age, Kerner’s pen would drip on his papers; without noticing, he would stack them, and blots resembling humans, and animals, skeletons and arabesques, would result. Kerner emphasized the randomness of this process: “[The images] did not emerge as a result of my will or power—I’m quite capable of drawing—rather they came about in [a way] that could only be revealed by ink blotting, often necessitated by the negligible assistance of a few strokes of the pen or artificial tracing of faces.”44 Though they began with chance, the images were finished by Kerner’s aesthetic choices – just like Hugo’s. (Figure 6). Whereas Hugo’s imagery dwelled in the melancholic Romanticism of seascapes and ruined architecture, Kerner’s featured corpses, skulls, dungeons, and the Black Death. He referred to them as “Hades images,” and wrote little poems to caption them. Fig. 6: Inkblot (“klecks”) accompanying poem “Memento Mori” from Klecksographien. Only – from ink drops. Therefore also in the inkwell. Those of you who write, take care! As with Hugo’s process, the unconscious develops in the obscured domain of the inkwell’s interior. For Kerner, however, the image comes from hell, a supernatural space that introduces mysticism and divination to the preservation of spilled ink. The conceit of the demonic or fanciful supernatural creature, familiar from the works of Johann Wolfgang von Goethe, E.T. A. Hoffmann, and others, formed the eldritch side of human nature that gave rise to the unconscious as the secret motive of apparently chance expressions. Kerner was a mystic, mesmerist, and parapsychologist avant la lettre; he believed in numinous other worlds, from which the klecksographien seem to have arrived. His most famous work, The Seeress of Prevorst (1829; trans. 1855), described the clairvoyant and telekinetic Friederike Hauffe, whose catalepsy Kerner had cured with mesmerism. Hauffe spoke in what she claimed was the original human language, which was also a kind of mathematics she continuously calculated. She narrated her visions of remote events to rapt audiences, and physical objects were said to move in her presence. She attracted a great deal of interest throughout Germany and in England, where Catherine Crowe, author of the popular Night-Side of Nature (1848), translated The Seeress of Prevorst into English. Kerner’s account, which Ellenberger cites as the first psychiatric monograph about an individual case study, went on to influence Carl Jung.46 Hauffe’s trance-like states, in which she uttered poetic, quasi-mythological pronouncements in her inscrutable tongue, seemed to access the past and other realms through an unconscious state. Divination invokes an older model of the accidental as the expression of God’s will, which the mystic alone can read from natural signs.47 As Fyfe notes, the assigning of accidents to divine providence persisted well into the nineteenth century.48 Hauffe’s visions, and Kerner’s interest in them, engage this older tradition, moving it into the modern world of scientific observation and recording. The seer can access a hidden world populated by fantastical creatures and driven by dark forces. Like Klecksographien, Kerner’s Travel Shadows (1811) and Sketches of my Boyhood Life (1849) share in this aesthetic. Travel Shadows presents Kerner’s travel impressions as a series of shadow show or camera obscura performances, which used simple projection techniques, cut-outs, and silhouettes to create spooky effects.49 Growing up across the street from an insane asylum, the child Kerner glimpsed figures and behaviors that partook both of spirit possession and mental illness.50 Freud would construct the unconscious out of similar materials, for example, making Hoffmann’s story “The Sand Man” (1816) the basis of repression in “The Uncanny” (1919). In the process, he would turn seeming accidents into symptoms of repression. As Kerner wrote of his ink blots’ popularity, “This ‘game’ with the thick blots then soon spread among many, and was for a time in our area and also afar, almost a game of fashion for both the old and young, and even in schools (often to the great grief of teachers).”51 Other kinds of ink games had been popular throughout the century; popular science manuals such as Chemical Amusements (1807) offered recipes for different colors of sympathetic inks using materials available from druggists, and instructions for games to play with them.52 In the simplest of these, a drawing of a leafless tree in winter would seem to burst into colored foliage and blue skies when brought near a fire, then disappear again when the paper grew cold. More complicated games, such as “The Book of Fate” and “Oracular Letters,” involved rigging the ink’s appearance to answer festive questions such as “Who is the merriest man in the company?” and “To whom will Miss *** be married?” Kristie Macrakis locates such games within the transition from Romantic scientific theory to early nineteenth-century illusionism and entertainment, including the popularization of “natural magic” as “rational recreation.”53 The ink blot games emerging in the latter nineteenth century were less instructive, delighting in artistry instead: Klecks in Germany; Blotto in England; Gobolinks and Blottentots in the U.S. Participants used the folding technique of the pliage to make symmetrical patterns of blotted ink, then wrote accompanying poems under timed conditions, with prizes awarded for the best compositions. Ruth M. Stuart and Albert Bigelow Paine’s charming book Gobolinks (1896) collects some examples, and offers rules for the game; it describes the Gobolink as “a veritable goblin of the ink-bottle, and the way he eludes the artist’s design proves him a self-made eccentric creature of superior imagination” (Figure 7).54 In the opening poem of John Prosper Carmel’s Blottentots (1907), one is instructed, “To make a funny Blottentot, first take a piece of paper, / Splash on some ink, a single spot, / Crease, press, but cut no caper.”55 In each, the images that follow are comically monstrous figures such as “The Graceful Pollywogs” and “A South-Sea Idol,” (Gobolinks) and “A Little Grass Midget,” “The Kangar-Rooster-Roo,” and “Sorry Grigs” (Blottentots). The names of these otherworldly creatures echo nineteenth-century racist discourses of “Hottentots” and “Golliwogs.”56 To white European audiences, they suggest the cute domestication of sinister forces. Fig.7: “The Butterfly Man” from Gobolinks. One can imagine children’s delight at being invited to spill ink, rather than being chided for it. As I noted earlier, throughout middlebrow nineteenth-century literature, children’s misbehavior often seemed to feature hurled inkstands, spattered ink, beatings and tears. Turning ink blotting into a game organized this chaotic energy into creative but disciplined activity. It also suggested that by the century’s end, child writers were better controlled by educational systems, so that their spilling of ink could become an appealing form of play rather than a wasteful irritation and sign of deficient literacy. Siegel writes of the rise of forensic engineering, which turned catastrophic technological accidents into learning opportunities; likewise, ink blot games made the accidental spilling of ink into “teachable moments.”57 Gobolinks and Blottentots adulterated ink-gazing’s divinatory power into craft, drawing delight and inspiration from ink that was not formed precisely and intentionally into clear handwriting or type. Like Hugo’s and Kerner’s blots, they represent a vestige of the Romantic desire to be enchanted by an illegible nature, now organized randomly and transformed by notions of practice, testing, and competition. The comparative, testable quality of these inkblots would carry forward into psychological testing; as would the dark, creatural imagery, which coincided so well with the primacy of childhood fancies in psychoanalysis. The Butterfly Man, like The Sand Man, is an ephemeral, dream-creature who may outstay his welcome, archived in the unconscious mind, and popping out randomly. Rorschach’s quest for precise images that would be neither too formless nor too formed was calibrated to cultural and aesthetic norms. He had to oppose a mass culture through which familiar images circulated. 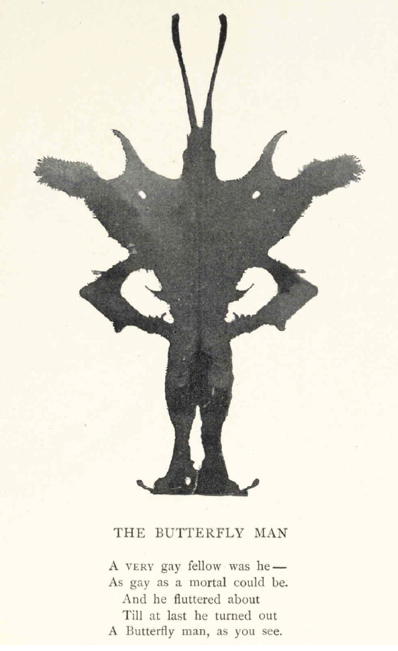 The psychologist and Rorschach test analyst Ernest Schachtel observed that the inkblots, “by striking at the empty shell of cliché recognition… speak to something deeper in the person….”63 He developed this insight by noting their fantastic quality, which evoke obscure animals and grotesque beings of the kind we have seen in Hugo’s work, Klecksographien, Gobolinks, and Blottentots. (Figure 8). This Gothic counter-aesthetic dominated the test’s visual vocabulary. Though seemingly opposed to mass culture, it was very much part of it. The aesthetic of the Romantic imagination thus transformed into that of the unconscious. One of the test’s requirements was that testers deceive subjects into thinking their imaginations were being evaluated, since this would free them to speak, when in reality they were producing unfiltered unconscious data. What had begun as a game of imagination had become a test of cultural conformity, reiterated through decades’ worth of Rorschach manuals that chart norms of formal responses. In this way, through the end of the twentieth century, individuals would generate unique psychological data by responding to images inspired by popular cultural aesthetics circa 1800. The preserved ephemeral – the ink spill, the false accidental image, the mass-reproduced Gothic image – materialized deep subjectivity. Fig. 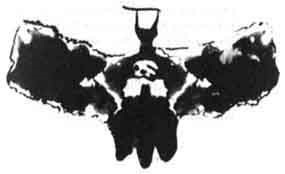 8: Card V of the Rorschach test. Informed by the hermeneutics of suspicion, the ideology of projection operates here. At first, Freud had limited projection to psychopathology; then he broadened it to become a defense mechanism, defining normal subjects’ relationship to the external world: one attributed one’s own characteristics to the outside world because they were too anxiety-inducing to acknowledge to oneself.64 The ideology of projection suggested that all social and environmental encounters were ultimately with oneself. Within this logic, the world was one big screen or ink blot refracting the unconscious.65 Projection thus culminated the social logic of the hermeneutics of suspicion, or the characteristically modern drive to avoid the obvious and the superficial in favor of unearthing and decoding what is hidden. This kind of paranoid reading can itself be seen as part of the taming of chance: to the suspicious deep reader, nothing is a coincidence. The rise of concepts of unconscious mind, with their conversion of expressive acts to behaviors, made everything about a subject interpretable to an expert, and opaque to him- or herself. This formation overdetermined the key concept of the “private world,” articulated in Lawrence K. Frank’s definition: “The essential feature of a projective technique is that it evokes from the subject what is in various ways expressive of his private world and personality process.”66 The private world represents one’s psychic deeps, but even the subject cannot inhabit it. Importantly, this zone is one of freedom from ordinary life, as David Rapaport wrote: “when a procedure is so designed as to enable the subject to demonstrate his psychological structure unstilted by conventional modes, it is projective.”67 The idea is part of a durable nineteenth-century genealogy in which the individual tests him- or herself against everyday life imagined as machine production. For example, Walter Benjamin wrote that the film actor “must operate with his whole living person, while forgoing its aura.”68 Yet Benjamin’s aura and Frank’s private world are brought into being by the mechanized apparatuses of mass culture against which they are ostensibly arrayed. The accidental is reconstituted in the spontaneity and dynamism of this interiorized self, and visually represented by the faux accidents of the ink blots. The irony of aesthetically imitating random accidents informed the printing history of the Rorschach test, which featured just such an accident. Rorschach had fought his first publisher, Ernst Bircher, to obtain the precise size, proportion, number, and composition of the card images that he wanted, but the printing process introduced unintentional shading into them. Rorschach realized that this chiaroscuro effect “could bring out finer nuances than were possible on the original inkblots, and he immediately adjusted to that.”69 Indeed, Rorschach introduced an entirely new category of “affective adaptability” that could be revealed by attention to shadow. This tension reproduces the two faces of ink – that which is precisely and rationally controlled for effective communication, and that accidental one which blots, spills, exceeds its bounds, and appears darker or lighter than it should. The drive to standardization balances the openness to the accident, which remains the inspiration for the test itself. But the accident always undoes itself, since, within the ideology of projection, the hermeneutics of suspicion, and the recuperative forces of industrial modernity, it can be made meaningful again. As Schachtel later noted, almost anything test subjects might say could be included as evidence of a diagnosis, since they were constantly projecting their unconscious material.70 The extensive dominion of the accident brings Aristotle’s definition of it, as incident rather than essence, back into play. Describing early word association tests – pioneered by Francis Galton as intelligence tests, then repurposed by Carl Jung as projective techniques – Rorschach’s mentor Eugen Bleuler conjured their capacity to deliver up the whole person from the most trivial of his answers: “The intent to infer the entire personality from the individual’s handwriting, the physiognomy, the shape of the hand, or even the style and the use of the shoes are not aspirations without a basis.”71 These traces are accidents, but they cannot be interpreted without an objective, standardized system – hence the drive to uniformly apply and constantly assess the validity of projective techniques. As Galison sums it up, the test “functions at the intersection of self and world, subjectivity and objectivity.”72 This intersection is also the locus of modern, preserved ephemerality: well into the twenty-first century, Hogrefe AG Switzerland (formerly Verlag Hans Huber) uses the same, nearly century-old printing presses, and follows secret instructions to replicate the original temperature and humidity of that first printing in an effort to reproduce the cards precisely.73 We can only assume they take the same care to replicate the printing ink of 1921. Spilled and blotted ink overturns our expectations of ephemera, converting its accidental and incidental aspects into meaningful, central qualities, and transforming its disposability into preservability. In the Rorschach test, it also reminds us that the inmost depths of the psyche take form through material practices and in response to popular culture. Freud offers the primary example of the reinvestment of accident with personal meaning, but his theory is only one piece of a longer and richer media history.